Now the sun has finally come out, you might want to buy this cool speaker. It'll make your shebang go with a bang. It's splashproof, so you don't need to worry about it getting wet if things get out of hand. You can connect up to three smartphones or tablets to it at once and take turns playing music. So you'd better invite guests with decent taste. Link a few of them together using the JBL Connect button, and the same song will play out of each, making for much louder sound. Dot a few of them around the garden, and you can well and truly irritate the neighbours. The 10,000mAh battery lasts for 15 hours, so will outlast all but the hardiest of partygoers. And it doubles as a speakerphone, though that might harsh the party vibe somewhat. It might also spook a few people if the caller can be heard through all the linked speakers around the garden. It'll go on sale in July for £249.99. We'd advise you buy one before the weather changes. 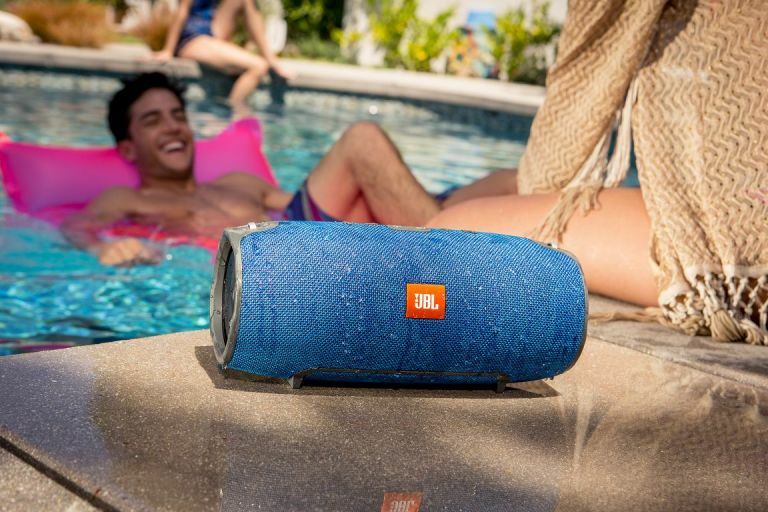 If you're after a smaller model you can take into the water with you, check out the UE Roll – it's a colourful, frisbee-shaped speaker that clips to your swimming trunks. Because if you can't look silly in the summer, when can you?